Upper extremity surgery has been facilitated by innovations in anesthesia. An interscalene block (ISB) is a type of regional anesthesia. 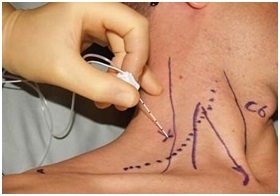 It entails an injection of local anesthetic numbing medication into the nerves (brachial plexus) in the neck region. 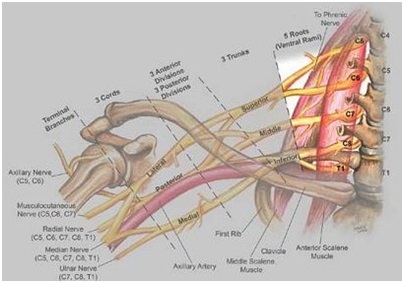 These nerves provide sensation and movement function to the shoulder down to the finger tips. This type of anesthesia dramatically reduces the amount of anesthesia used during surgery as well as help with pain for many hours post-operatively. These factor into a more comfortable surgical and post surgical experience for the immediate time around your surgery for about 12 hours. Use of ultrasound has enhanced the accuracy of performing the ISB at Massachusetts General West (MGW). An anesthesiologist administers the block after obtaining consent in the pre-operative area under light sedation. 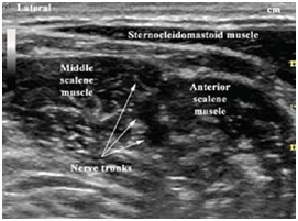 The doctor can visualize the anatomy of the nerves (brachial plexus) with the ultrasound probe. The allows the medication to be delivered to the correct area for accuracy, efficacy and safety. 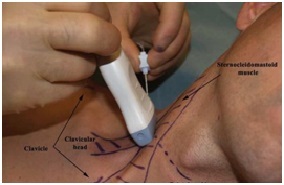 The ISB can be used alone or in addition to other anesthesia per the wishes of the patient. Almost all patients have ISB in addition to general anesthesia. Having the ISB reduces the amount of adjunct anesthesia used to keep the Pt comfortable which directly correlates to less side effects such as post operative nausea and somnolence. ISB at MGW is used for most upper extremity surgery: arthroscopic rotator cuff repair, subacromial decompression, AC joint resections, biceps procedures, SLAP repairs, shoulder joint instability procedures such as Bankarts or Latarjets, elbow arthroscopy, repair of fractures of the elbow/forearm/wrist/hand/fingers, just to name a few. Since ISB is used for many surgeries at MGW, a prospective study was performed from 2005 to 2008 to review its efficacy and safety. More specifically, the population of patients that were followed was going to have an arthroscopic shoulder surgery using an ultra-sound guided ISB performed by a staff anesthesiologist at MGW. The study enrolled 1319 patients. Each Pt was followed for 24hrs with a phone call by a physician to access satisfaction, screen for minor and major adverse effects. 3 patients out of 1319 had permanent complications. 2 had a brachial plexitis and later were found out to have an underlying neurologic disorder after further workup. One had multiple sclerosis and the other, transverse myelitis. The 3rd patient had a heart attack the day after surgery. The heart attack was not a direct result from the ISB.